Directed by creature sculptor and sci-fi aficionado, Steve Wang, The Rescue Mission is probably the most different an episode of Power Rangers has ever been. Taking inspiration from a plethora of Sci-fi thrillers, this episode pits two of our rangers and a group of selected Terra Venture soldiers against an unknown alien threat. Receiving a distress signal from a damaged spaceship, Mike (Magna Defender) is tasked with putting together a rescue team to go explore the ship. 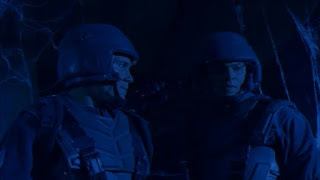 On the ship, his team (composed of his brother, Leo/Red Ranger and a bunch of other red shirts), run into the corpses of the ship's old crew, as well as the alien beast who killed them. This is a big deal for Power Rangers, as it's really the only time corpses are seen. (We've had zombies and skeletons sure, but this is something else.) The alien seems to be protecting/targeting a book that Leo finds in the arms of one of the fallen crew. Mike's team eventually gets captured, and it's up to him, Leo and the other Power Rangers to save the day. On their way out of the ship, we also get a nice callback to the first episode, with Mike almost sacrificing himself for Leo again (and the book too.) Everyone makes it out okay, and the aforementioned Galaxy Book ends up in the hands of Terra Venture. Said book will initiate the plot for the remainder of the season. There is not a lot wrong with this episode. There's some bad line deliveries by some of technicians in Terra Venture (they sound dubbed over actually) but most of the episode is really well written and well acted. I think the main problem the episode has is that it's not really a Power Rangers episode;it's something else entirely. 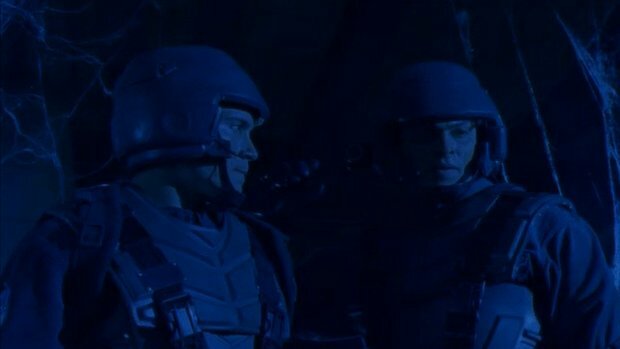 This episode feels like the characters from Lost Galaxy ended up in another sci-fi show by accident. While the episode is thrilling, and for the most part, plays heavily into the plot of the show, there are times where it is so off-brand that it takes you out of the moment. I know as a kid I was legitimately terrified of this episode. It's still not the easiest thing to watch, if I'm being completely honest. Most of this is due to the direction of Steve Wang. He's amazingly talented, but he doesn't seem to quite get what Power Rangers is at times. Wang directed Guyver, as well as the Kamen Rider Ryuki adaption, Kamen Rider Dragon Knight. Guyver goes hard on the gross-out, violent factors of sci-fi, and Dragon Knight pushes the slower pacing found in most Japanese dramas. Power Rangers was both a great fit for him, and a terrible fit. I think it's why he only directed that one episode. Truth be told, it would be fun to see what he'd do with an entire Power Rangers series....but it might end up like Dragon Knight. 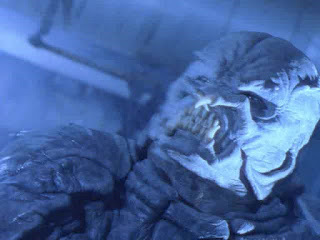 The last problem with this episode is that the origins of the Galaxy Book, the dead ship crew, and the terrifying alien creature are never explained, but then, a lot of Lost Galaxy is left unexplained. It's one of those allowances you have to give Power Rangers sometimes- things will not always be clearly ironed out. The upcoming film is not as grimdark as people seem to want it to be, or think it will be. However, it is trying to move away from being mostly camp like Mighty Morphin was. (There will still be campy moments if the trailers are anything to go by.) The Rescue Mission gives us an outsider's look at what Power Rangers could be- dramatic, sci-fi storytelling. The new movie seems to strike a balance between the campy, fun side of Power Rangers and this more dramatic, sci-fi fare.